Let’s move together – with this motto, the University Sports Festival Budapest will be held on the 27th of November 2016, organized by Eötvös Loránd University (ELTE), the Student Union of ELTE, Erasmus Student Network (ESN) ELTE and Budapest University Athletics Club (BEAC). The main aim of this event is to provide such a community experience through sports for the exchange students in Budapest, that brings international students together from any educational institutions. Foreign students will get an insight of the university sports life of Budapest and they can try the latest, most popular sports in a casual and fun way. Trying individual and team sports are both possible at the USF Budapest event, and a competition between the universities will be also organized. At the end of this event, the sportiest higher education institution will receive an award. Date: 27 November 2016 (Sunday), between 14:00 and 22:00. 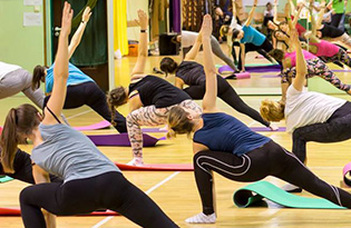 You can try more than 10 sports between 14:00 and 22:00, such as aerobic, yoga, polefitness, Zumba, functional training, combat sports, street workout, stability workout, Interval/HIIT training, spinning, wall climbing. There will be introductory shows, playful and in the sports. The units of the events will be held by professional, English-speaking coaches and organizers. Students who register to either individual or team sports, can get to know and try any sports they would like. We give points and evaluate universities’ activity level: the more students try the most kinds of sport, the more points will be given to their university. In Volleyball and bubbleball, we organize a championship with maximum 8-8 teams. In a there can be minimum 8, maximum 12 players from the same school. Each placing will be worth different points to collect. The GRAND FINAL (relay race) will be a playful team competition, with which we close the event. Players of both individual sports and team competitions may participate. This race will be the most exciting event of the whole day, and the finale of the USF Budapest. We accept teams of minimum 15 players, but anyone can join these teams at the scene, who registered as an individual or a team player. 1000 HUF per person that can be paid by the participants applying individually at the scene of the event. For the team events (volleyball, football, GRAND FINAL) you can apply by handling in the application form in out BEAC office, together with cash or transfer payment until the 18th of November. Attention! Those students who applied for team sport can try all the individual sports as well, but participation in the team sports is only possible with a separate team application! Anyone can attend the GRAND FINAL (relay races) between the universities, in their own universities’ team. fee is requested only once. You can enter the event with a valid student card, university ID card, or alumni card.